Ableware Cord Type Zipper Pull from HealthyKin.com makes dressing easier by giving the user control of zippers. A split ring is attached through the hole in the zipper tab and the hook on the end of the pull engages the ring. 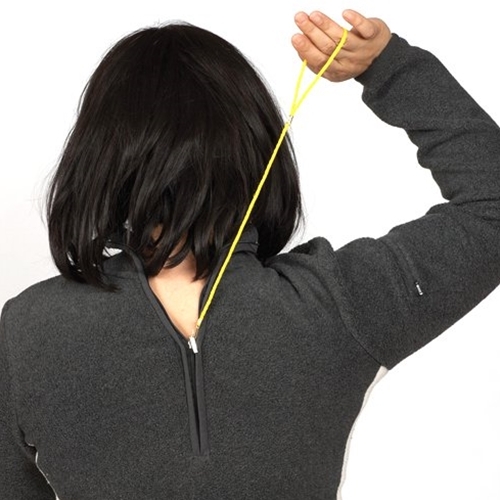 When the zipper is fully closed or open, the hook is disengaged. Ten 1/4" diameter split rings are included for hooking to zipper tabs. A very easy and handy tool. I love it so much I'm buying more as gifts, and recommending this tool to as many others as I can. I love this. It works just as I wanted it to work. Split ring is a little hard to open, I have to use a small screwdriver to open, but it is well worth the trouble. I have put a ring on every back zipper dress I have! I feel that shipping is steep. It could have been mailed in a mailing envelope to keep costs way down! Great accessory for me with zipper problems! Getting the zipper pulls on was a bit of a challenge but the thing works great!! !